...Dayton Pump Motors & Agriculture Solar Generators Powered Water Energy Increases Efficiency, Lowers Costs and Maintenance. We offer tailor-made solutions that work with you to create energy cost savings. 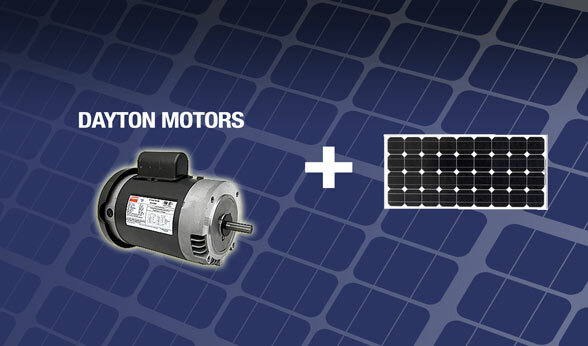 Dayton Pump Motors and Agriculture Solar generators are dedicated to finding energy-efficient solutions for our customers and business partners. For nearly 80 years, Dayton Motors has strived to provide customers with the best value and reliability in industrial electric motors. That dedication shows in customer preference for Dayton pump motors. Dayton Motors for Pumps introduces its line of pump motors. Our highly engineered pump motor combined with Agriculture Solar's generators are equipped to work at mazimum effeciency. • Increased efficiency with pump motors having been designed to help reduce energy consumption and save you money. • The more efficient, cooler-running motor helps provide a longer-lasting motor. • Size provides a cooler running motor, improves efficiency, extends bearing life and reduces motor degradation. • High-grade electrical steel reduces energy losses and improves efficiency. • Tighter tolerance between the stator rotor reduces magnetic flux losses. • Lower-resistance rotors with a special slot design and higher-grade aluminum bars help improve performance and efficiency. At Agriculture Solar, Dayton Pumps and Agriculture Energies can be your simple water pump solution for off the grid. Electric motor-driven systems used in industries consume 63% of all electricity used in U.S. industrial/commercial/agricultural sector according to a U.S. Department of Energy report. This report shows that companies that practiced DOE “best practices” actually averaged 33 percent savings if they were to apply motor and motor system efficiency upgrades. The potential positive impacts on companies’ bottom lines and the environment are significant. Agriculture Energies systems have been dedicated to modern agricultural irrigation and successfully active in the top irrigation fields for over 10 years and continues to bring the tried and true principles and advantages of solar hybrid power. Think about it, and then make your move. Let Dayton Pump Motors and Agriculture Solar water management provide you with decades of reliability and lasting value. We invite you to explore the possibilities of our reliable hybrid solar powered pump solutions.